My breakfast preferences are always savoury over sweet — am I alone on this one? To me sweet foods are better reserved for desserts or as an occasional treat. When I was a little girl, I loved my mom’s weekend breakfasts. This was when she had more time to make one of her elaborate Mexican breakfasts that I so looked forward to. Her savoury breakfasts were always (and still are) my first choice. Ranked pretty high were always her chorizo and eggs; The scent of the chorizo spices wafted around her kitchen and they drove my belly insane with anticipation of that first bite. My mouth waters just thinking about it. I still love chorizo and eggs for breakfast…lunch…and dinner too. Thankfully soyrizo came into my life so that I can continue to enjoy the delicious flavours of traditional chorizo without having to eat meat. Even though I’ve eaten my fair share of meat chorizo, when I eat soyrizo I do not miss the meat at all — in fact I would go as far as saying that I prefer the vegan version to the meat one. It’s that good! When I cook soyrizo for breakfast tacos most times I cook it just as you see it here, but occasionally when I’m really hungry I’ll scramble in an egg or two. Though there are many traditional and non-traditional Mexican breakfasts that I enjoy, it’s always a fun challenge Veganizing some of my most favourite breakfast choices. 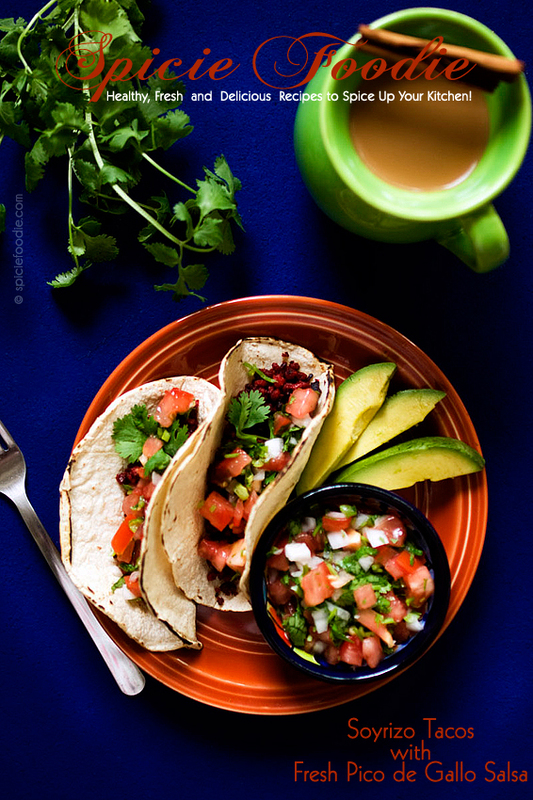 These savoury tacos are delicious for breakfast, brunch, lunch and/or dinner — I’ve eaten them for all meals. If all of that isn’t enough, soyrizo is inexpensive and the effort involved in preparing it is minimal. In about 30 minutes you can have a filling, nutritious, delicious, and inexpensive meal on your table. I hope you enjoy these breakfast tacos as much as I do. *Disclosure: This recipe was also shared on Canned Time for the Breakfast in Bed Event. 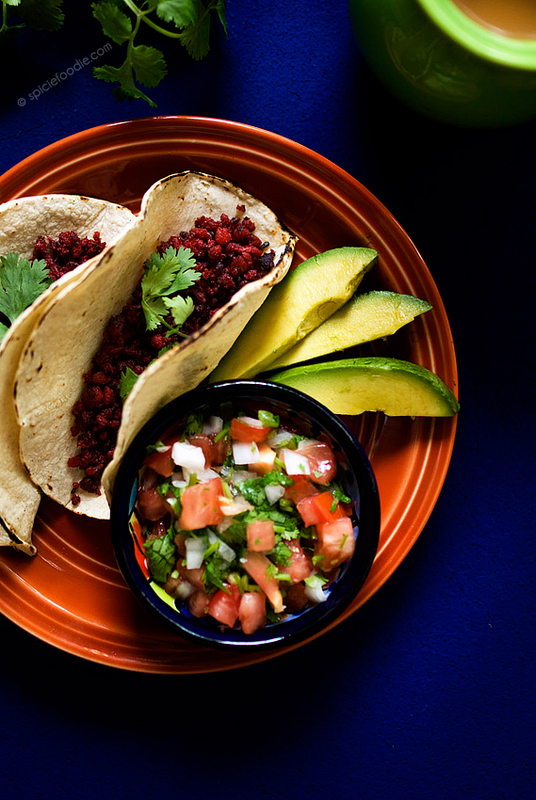 A veganized and healthier version of chorizo tacos. Eat them for breakfast, lunch, or dinner! 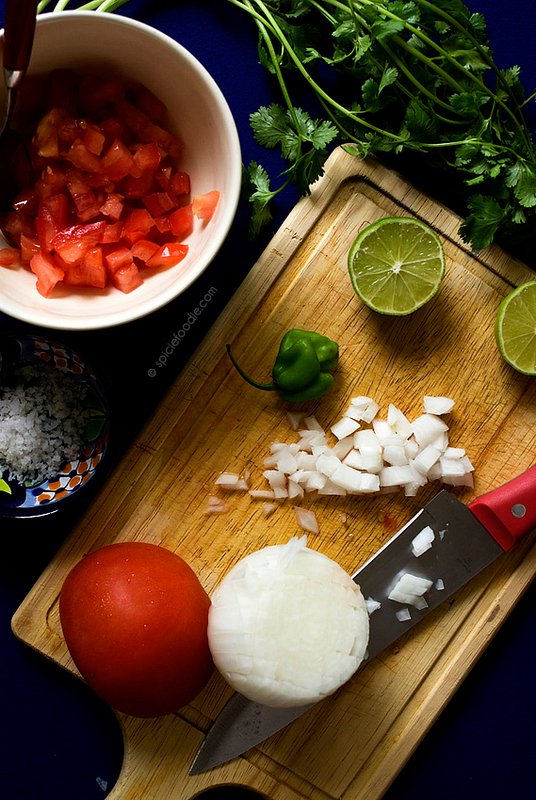 First we will make the salsa: Mix the chopped tomatoes, onions, pepper and cilantro until well combined. Add half to the lime juice and sea salt and combine again. Taste and if needed add the rest of the juice and more salt. Place in the refrigerator until ready to use. Heat enough olive oil in a pan to lightly coat it and prevent the soyrizo from sticking. Once warm add the soyrizo to the pan. Using a wooden spatula or the back of a spoon, gently press the soyrizo down to break up until it resembles coarse crumbs. Saute it until it darkens and dries to resemble ground meat — soyrizo has liquid so it’s imperative to cook it all off. You’ll know the soyrizo is ready when it’s firm. Allow to cool slightly. In the meantime remove the salsa from the refrigerator and heat up the corn tortillas. Place a tablespoon or two in the middle of each tortilla, top with salsa and extra cilantro if desired. Served the avocado slices inside or on the side of each taco. Serve 3-4 tacos per person. * Make sure you choose one made with Non-GMO soybeans. 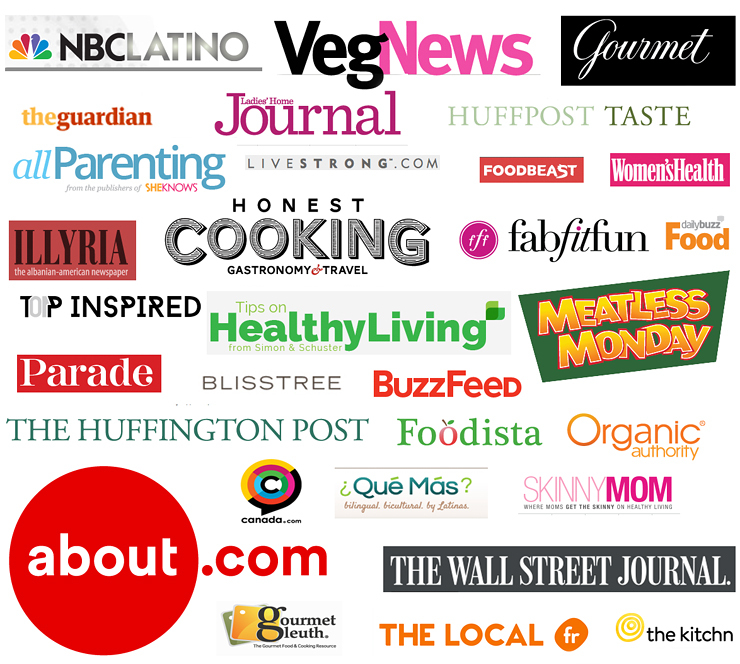 Also look for a brand that does not use artificial colouring, try to find one that uses annatto seed or achiote. Lastly, read the label to make sure there aren’t any additional “filler” ingredients included — like flours or starches. ** Habanero peppers are quite spicy but you can use fresh jalapeños instead. To make it even milder first remove the seeds and vein from inside the chile. *** This filling may also be used for vegan/vegetarian burritos, to mix with other ingredients for a breakfast hash, or additionally potatoes and onions may be mixed in with the chorizo for an even more filling meal. If you have vegetarians in the family simple mix in lightly beaten eggs to the cooked chorizo and continue to cook until the eggs are cooked through. The possibilities are endless. I hope you have a beautiful weekend amigos! Fresh and delicious! Those healthy tacos are really tempting. The tacos must be very fresh and delicious with that wonderful salsa, Nancy. Awesome share! 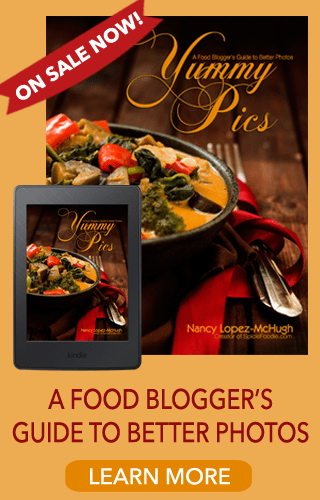 There are always more blogs on my plate than I can manage to catch up on, but I always love your photos and I’m definitely loving this recipe. I love the challenge of veganizing great eats. Thanks for sharing! Just looking at this delicious plate you would never know that these aren’t made with meat. Excellent tacos Nancy. Loved the simplicity of the pico de gallo salsa you made. A fresh side perfect as a condiment for tacos or any BBQ meat. I’ve always wanted to give soyrizo a shot. This gives me some incentive to finally go for it! Thanks Nancy, Good read! Thanks for sharing this! I cant stop staring at the wonderful colors for the dishes! Continue sharing wonderful posts like this one!